Murl Marsh, 90, formerly of Delta, Colorado, but more recently of Emmett, Idaho, died peacefully at his home in The Cottages Care Facility in Emmett, on Sunday, November 18, 2018. Funeral Services will be held at 2:00 p.m. on Saturday, November 24, 2018 at the Emmett Church of the Nazarene, located at 1144 N. Washington Ave. Interment will take place the following week at the Veteran’s Memorial Cemetery of Western Colorado in Grand Junction, Colorado. Local arrangements are under the direction of the Potter Funeral Chapel in Emmett, Idaho. Friends are cordially invited to view the obituary and sign the online guest registry at potterchapel.com. Murl was born at home on the family farm in Portales, New Mexico on June 7, 1928 to Flora May (Bourne) and William Henry Marsh. He was the second of twins, and a happy surprise as his mother didn't know that he was coming. The doctor was out of town and Murl was helped into this world by his older sister Marie Ritthaler. She said she'd just been sent out to wave a white sheet to signal the neighbors for help but those boys were determined to come into this world quickly and she was called right back in to help her mother. Muri was the quieter of the two babies, and always had a quiet, somewhat shy disposition. The twins thrived and Marie liked to tell how their mother would pack his brother Earl and she'd pack Murl everywhere the ladies would be going to do their work. The Marsh Family would later move to Delta, Colorado where the family farmed throughout Murl's school years. The boys have been close their whole lives, sharing a jeep, a tractor, and animal husbandry and farming enterprisings as young men. They had many hunting and fishing stories to share over their favorite activity of "Shoot the Moon" dominoes tournaments. Murl joined the army in 1950 to avoid the draft. He served his boot camp time in Camp Roberts, California where he quickly earned his expert rifleman, but being a regular foot soldier was not in the cards for him. At the end of the camp volunteers for army medics were asked to apply and Murl's great service records and grades earned him a spot as one of these army medics. In North Korea, Murl served on the front lines helping many, many U.S. soldiers make it back to the army hospital behind the lines of fighting. He was wounded in the line of duty before being honorably discharged, September 12, 1952, and sent back to his family's home in Delta, Colo.
Murl used his army GI education benefits to attend school in Pasadena, California, where he pursued a BA in education. While there, he met his wife Freda Walker at a church bowling event. She had plans that night when he asked if he could drive her home, but told him that she'd, "...take a rain-check." He called her back a couple of days later and they soon found that they had much in common: a love of God; love of travel; love of children; love of art; and families that had farming roots. They married on July 24, 1959 in Pasadena, California. It was a love story that lasted the rest of their lives with Murl remaining faithful to her memory even after Freda's death on April 4, 2007. Murl was a member of the Nazarene Church. He was a previous member of the Church of God in Delta, Colorado. His love for the Lord was obvious in his service to his fellowmen, and his church stewardship. Murl loved children and taught in elementary schools in Washington, Guam, and Idaho. 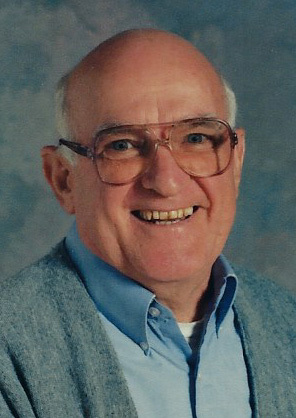 He retired after 33 years of teaching in the field of education from Weiser, Idaho in May of 1991. He spent his time, working in grades ranging from fourth grade through college; teaching subject areas of general education, specialized reading, and basic and advanced art classes. Murl was preceded in death by his wife, Freda (Walker) Marsh; his parents, Flora May and William H. Marsh; older sisters, Christine Donnel and (Muadie) Marie Ritthaler; older brothers, Archie H. Marsh and William E. Marsh; and granddaughter, Karen Beesley. He is survived by his twin brother, Earl Marsh; younger sister, Fronia Mae Taylor; son, Mark D. Marsh; daughters, Noreen A. Beesley and LeAnn M. Marsh; grandchildren, Kristine Skiff, Brett Beesley, Zachary Beesley, Tyler Marsh, and Nicholas Beesley; and great granddaughters, Megan Skiff, and Salem Marsh.